Like location, climate has been a decisive factor in shaping the Newfoundland and Labrador experience. The overall climate of the province is marked by considerable seasonality and volatility, often with short-term changes to the weather patterns that can be difficult to predict. Satellite Image of Newfoundland and Labrador, 1980. Taken on the 11th March 1980 at 1136 GMT or 0806 NST (7:16 a.m. in Western Labrador). The photograph shows the late winter pack ice off the eastern coasts of Labrador and the island of Newfoundland. The pack ice is generated within the region as landfast ice or new growth offshore, but incorporates varying amounts of ice from Baffin Bay, Hudson Strait and the high Arctic, some of which is multi-year ice. The movement of the pack is generally southward and landward under the control of the Labrador Current and the Coriolis force. Daily (and hourly) changes in the distribution and pattern of the ice, on the other hand, result from variability in the atmospheric controls, that is, wind direction and strength. From the 2nd to the 8th of March the prevailing wind had been between westerly and southwesterly over much of Labrador and the island. As a result, the main pack had moved off the eastern coasts by the morning of the 11th, leaving a series of large open-water leads immediately offshore. The more compact windward (western) edge of the pack contrasts markedly with the diffuse, irregular and embayed, or "loose" condition of the leeward (eastern) edge, characterised by sea leads, polynyas, ice-tongues and open-water bights. Considerable amounts of locally generated landfast ice remain along much of the Labrador Coast, especially north of Groswater Bay where the highly indented coast and numerous offshore islands encourage its persistence. Landfast ice has largely disappeared from the island's eastern and western coasts, reflecting the mild winter of 1979/80 in Newfoundland. An open-water zone or 'lake' is also evident immediately off the west coast of the island, which can be attributed to southeasterly winds associated with high pressure along the east coast during the 24 hours immediately prior to the time of the photograph. Such a circulation would tend to force the inshore Gulf ice to retreat northwestward and off-shore. The same phenomenon on a smaller scale can be seen at the bottom left edge of the photograph. on the western side of Grindstone Island. Further evidence of the mild winter is the fact that Gander and Grand Lakes are already clear of ice, although Lake Melville in Labrador is still blockaded. 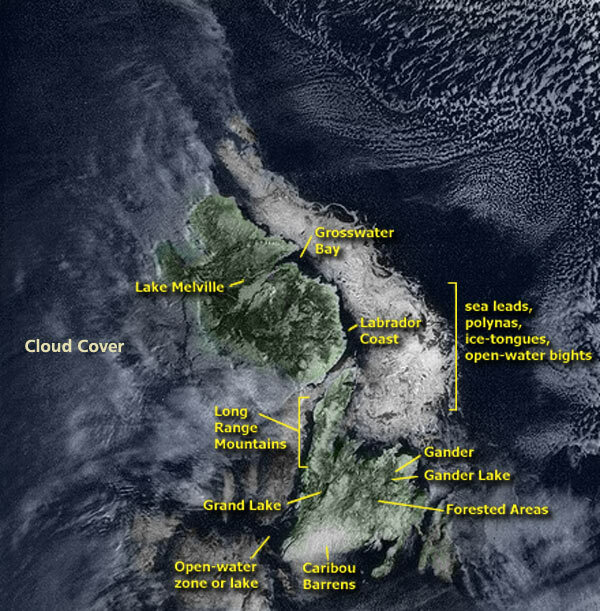 The photograph also shows contrasts between snow-covered open areas-such as the 'caribou barrens' of the south coast of the island, the burnt-over area northeast of Gander, the Long Range Mountains, and the Labrador Coast- and the forested areas of the island's interior. Modified by Tina Riche from a black and white image courtesy of the Shoe Cove Satellite Station, Shoe Cove, Conception Bay, NL. Original image taken by the NOAA 6 satellite in the visible (red and green) waveband, and obtained from the United States National Oceanic and Atmospheric Administration (NOAA) by the Canada Centre for Remote Sensing. The extensive area of cold water and seasonal ice offshore, including the Labrador Current system, has a direct bearing upon climate and weather; and the distinctly warmer Gulf Steam/North Atlantic Drift system to the southeast of the Grand Banks affects the properties of air reaching the province from the south and east. In addition, landform features such as prominent uplands, and mountain ranges, and sheltered valleys and lowlands, influence the finer details of climate and weather. Because the province extends across a considerable span of latitude (46.5-60.5°N) and longitude (from the continental interior of western Labrador to the southeastern peninsulas of the island with their exposure to the sea), the timing, duration and climatic character of the seasons varies substantially across the province. 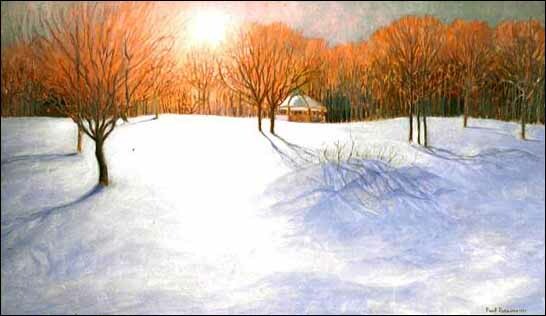 Painting by Paul Parsons entitled "Bannerman Park"
A fall scene with a early snowfall. ©1971, Oil on Masonite, 45 x 76.5 cm. Reproduced by permission of Paul Parsons. Oil on Masonite ©1971. Courtesy of the Art Gallery of Newfoundland and Labrador, Arts and Culture Centre, St. John's, NL. Winter, defined here as the season having long-term ("climatological") average daily temperatures below freezing (0°C), varies in length from approximately six months over northern and western Labrador (November through April) to four months (December through March) over much of the island. Over much of the interior of Labrador temperatures remain in the range -5 to -30°C for prolonged periods, with a continuous snow cover, but due to more frequent polar and arctic high pressure patterns, the weather is clear and drier. The southeast corner of Labrador has winter weather more akin to the island, being subject to vigorous storm systems approaching from the south and southwest, resulting in more frequent precipitation and high winds. On the island especially, a major characteristic of winter is the wide variation in snowfall, and the depth and duration of snow cover, both spatially and between winters, which is of particular significance for water resources, ground transportation systems and winter recreational activity. The main highway in southern Labrador is reduced to a single lane following the big storm of March 1995. Total snowfall accumulation for the month of March was about 200cm. 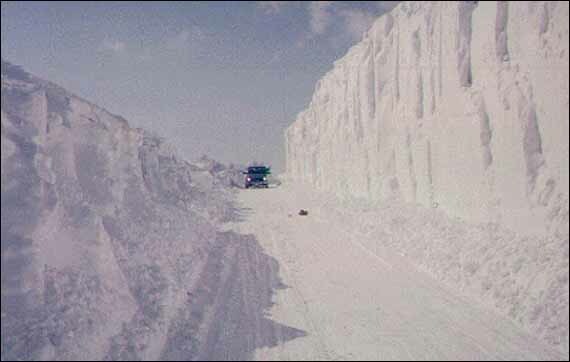 The largest drifts topped 12m. Reproduced by permission of Ewart and Sharleen Linstead. Photos ©1995. The onset of spring is delayed by a prevalence of cool polar air masses and low sea surface temperature. Mean daily temperatures reach the melting point earliest over the Avalon and Burin peninsulas (near April 1), but about a month later over lowland southeastern areas of Labrador and the Goose Bay area, and not until the second half of May over northern Labrador. Coastal areas exposed to the north and east endure repeated spells of low cloud, fog and light precipitation, though areas well inland and to the west are much less affected. In general, however, there is a significant reduction in both precipitation and the frequency of high winds during the period from May until July, more especially on the island. 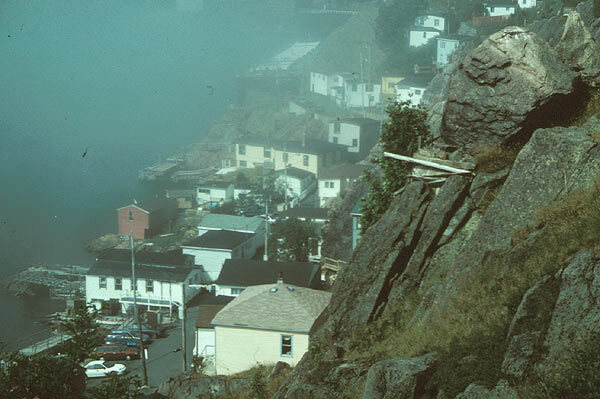 Spring Fog Bank Over the Outer Battery, St. John's. Reproduced by permission of Trevor Bell. Photo ©1995. The retreat of the polar front jet stream to the north, combined with the shift in prevailing wind direction to southwest, causes a change in the temperature patterns by mid-late June. The highest daily maximum temperatures of summer (typically 27-31°C) normally occur well away from the south coast, which is now more vulnerable to sea fog. There is a marked cooling northward on the Northern Peninsula, whilst Labrador, which remains closer to the northern summer cyclone tracks, normally experiences a wetter summer than the island. During the fall the southern coasts of the island cool relatively slowly, owing to the thermal lag of the ocean and delayed onset of colder air masses from the north. Consequently, the mean daily air temperature on the Avalon Peninsula does not fall below 0°C until almost mid December, two months later than for western and northern Labrador. Over the entire province there is a marked increase in precipitation and strong wind frequencies during October and November. For other Climate related articles view the Natural Environment Table of Contents.